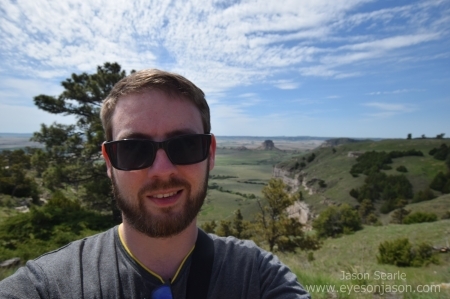 We used the time to visit the Scotts Bluff National Monument again, just this time in daylight hours (and to visit the top of the bluff). The weather was glorious and I managed to record our drive up to the top of the bluff. 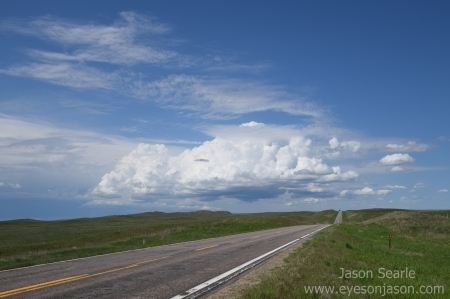 There were some impressive views across Nebraska and we could even seen storms popping up in Wyoming to our west. We stayed a good hour and a half, wandering around the bluff and admiring the views. We bumped into a young lady and her daughter, mum and aunt whom gave us some more information about the area and said that the area is usually brown with drought, but a recent rainfall event about a month ago saw 7 inches of rain fall in a day (usually only receiving about 16 inches over an entire year), so the area was much greener than normal. Upon leaving the bluff, we discussed with Daniel the options. He was keen to shoot up to South Dakota to see the risk near the Black Mountains, whereas we saw more potential in NE Colorado and into Nebraska. We parted ways and head south to Kimball, where our plan was to stick in this sort of region for a little longer and see what the mesoscale discussions (MDs) were saying and launching off when we got news. Our meal was a relatively standard Pizza Hut at Kimball. Talking with See Nature's Fury, they were also in Kimball and holding fire in a similar way. An MD was issued for eastern Wyoming and South Dakota. We could see the storm heading towards us and we made a bolt north. A bit of navigating gave us a north south road up via Scottsbluff and towards Mitchell, with view to wait in Agate for it to roll over us. As our luck had it, the storm started forming a line and eventually started to die off. Typical! We were already on the road to South Dakota at this point and I had noticed some initiation directly in front of us. This had started suddenly, and we watched as the convection grew high into the sky. We saw it form several pileous clouds as it pushed the cap, before it broke through with relative ease before developing explosively through it. This was our cell and, one that not many chasers (if any) were on. Thankfully we were on a good north-south road in order to chase it further north. It soon started to develop supercellular characteristics, with some lightning developing from it. There were also signs of rotation in this storm, both visible and radar-indicated. We were impressed! We pushed on further north to Harrison, before taking an east road towards Crawford with the hopes of a north road to take us out in front of it. 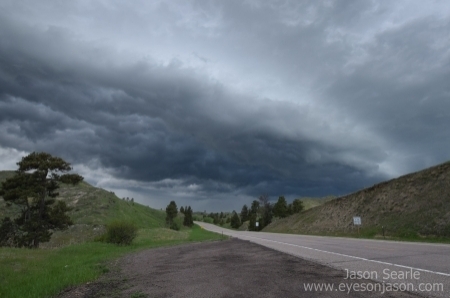 Our views on the road to Crawford were spectacular - we had canyons and trees, with an ominous shelf cloud rolling towards us in the background. We were concerned our north road curved to the west and would put us in the direct path of it. Thankfully, a few miles further east there was another north road at the town of Chadron. We got some more spectacular views of the structure a we carried on east. 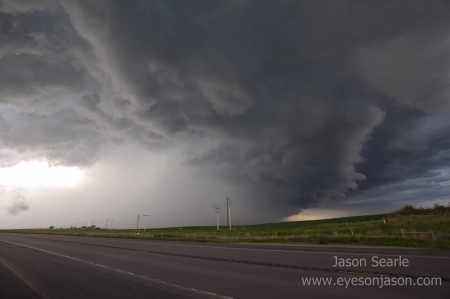 We then managed to go back and drive parallel to the line of storms that it had now become. There were areas of rotation indicated on the radar and we did see some small, messy wall clouds dropping from the storm. We were close to the South Dakota border at this point and we decided to head towards the town of Oelrichs before the core hit. The hail was only indicated to be 2 inches but we wanted to keep in front of the storm. 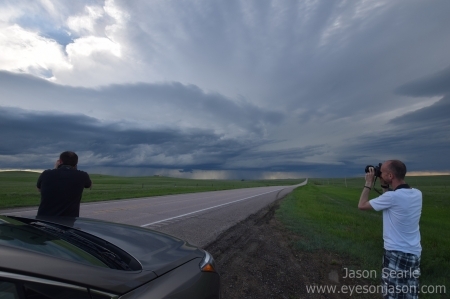 As we did this, Reed Timmer blasted southwards passed us, of which we expected him to be chasing the tail-end charlie of the line, which had briefly crossed my mind. It seemed a bit far south to chase, so we kept on our line. An east road at Oelrichs saw us another east road towards Oglala. We took this and pulled up a few miles east of Oelrichs, contacting Daniel Gregory, who had also decided to head towards our location. Whilst sitting just off the road, a new cell appeared on radar directly to our south. It appeared suddenly and was massive. This could be the cell that we wanted as it was discrete and heading in an east-northeast direction. We could get in front of this storm if we drove to Oglala and then pushed through to Pine Ridge. My concern was this road was purely a west-east road, but did curve north to let us get in front of it. It was going to be close, but felt that we could get out in front of the storm and power on east at Pine Ridge and power on in front of it. At this point, the storm intensity grew exponentially. It was severe warned, but had no tornado warning, despite some areas of some strong rotation. No clear hook or tight rotation was noticed in our location, but my goal was to get the team to Pine Ridge and eastwards as soon as possible. It was quite intense getting everyone to understand why we needed to push on and not get out to take photographs, but once Olly spotted a funnel forming just in front of exit route, I think the team understood and we powered on East (albeit through a small residential area with awful speed control measures). Moving a few miles east, it was safe enough to get out and get taking shots of the structure that had formed behind us. It still hadn't gone tornado warned, but we did feel confident with the signs and characteristics it showing that a tornado was likely. We did spend some time watching and pushing east, but it never did drop. Our next challenge was to find somewhere to stay and to refuel. We had about 100 miles on the range and although we drove to Allen for a gas station (where the core could scrape by us) the gas station was abandoned. This posed a problem. There were barely any hotels in this area of South Dakota and we had decided Hot Springs was our target for the night, which was about 100 miles away... We had one about 15 miles to our east in Martin, but this would have been a 30 mile detour from our target destination. The other was on the route in Pine Ridge, which we had been informed is pretty much a no-go area in the Indian Reserve that is there (there is a longstanding resentment towards caucasians due to the history and the way their tribe has been treated over the years). We decided to keep to the main road gas station and then power on to the Hot Springs American Best Value Inn for the night. Hot Springs was nice - although our late return meant most food venues were closed, so a gas station dinner was on the cards. Thankfully I had half of my pizza from lunch left over, which I scoffed quickly before falling quickly to sleep.